The Annual Holiday Party is Friday December 14th from 8pm-11pm at The Jetty. We are less than two weeks away. If you have not already done so, sign up at the front desk. $55 cash is due by Monday December 10th. We will have the entire bar to ourselves for the three hours. There will be open bar, buffet style dinner, dessert and you’re more than welcome to bring your dance moves. Please continue to respect the hours of open gym and class times. If you are using the open gym hours that lead right up to a class, please have your equipment cleaned up before that next class time. The open gym hours are set and unfortunately we don’t have more gym space to allow for open gym during class. Thank you. *You will pair up with someone and count each other's reps.
strength, speed, endurance, stamina, balance, coordination, accuracy and flexibility. power, speed, balance, coordination, accuracy, flexibility, stamina, endurance and agility. 5:30am class will begin at 5:15am today!! After yesterday, you get a team style workout today. The 5:30am class will begin earlier at 5:15am. The first 200 calories should get you warm. For the rest of classes, we are essentially prepping the movements in the workout. All the reps are shared between the teammates. If you want to keep it to teams of 3 and the class is large, some teams can do the workout in reverse order so noone is waiting for equipment. This should be a fun day. Today we are training strength, power, speed, stamina, coordination and balance. 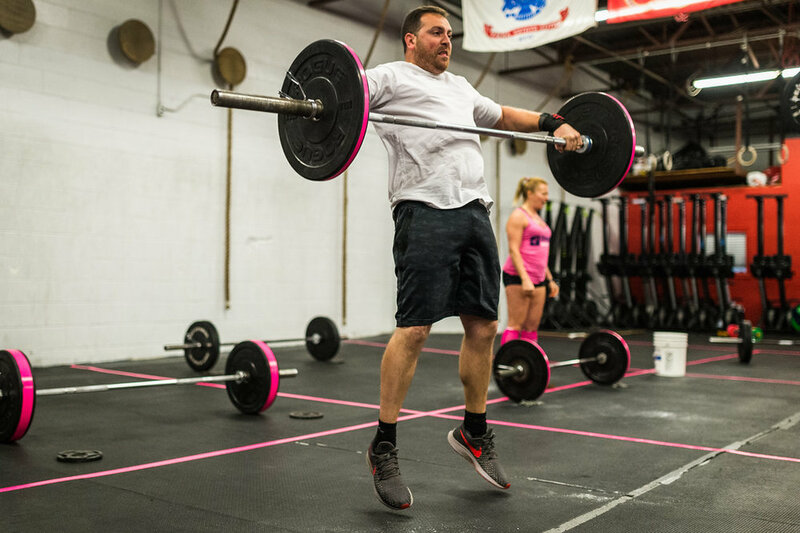 We are going to be phasing out the focus of olympic lifting and adding some other strength building components into the program such as deadlifts and strict pull-ups like you see in today's program. We will still have the oly lifts in the program in workouts or strengths but it will not be a centered focus. We are starting a deadlift cycle for sets of 10. We will do this every 10-12 days for about 80 days. That will bring us two weeks out from the Open. The plan is to have the deadlift and mid-line strong for heavier weights as we are asked to move them for some higher volume. In the workout today, we are hitting consistent squat cleans, getting some fatigue and then attempting a set of max strict pull-ups each round. Building this strict strength will be so beneficial for every single member in the gym. Today we are training strength, power, speed, stamina and flexibility. new. 25 reps each arm on the clean and jerks; and 25 reps each arm for the overhead lunge.